There are four matches taking place in the Royal London Cup today, which means that even if all of my predictions turn out incorrect I will still have more right than wrong at the end of it, as I am currently on 12 out of 19. At 220-3 in the 42nd over Surrey would have been entertaining hopes of getting close to 300. At 241-8 Essex would have been hoping to restrict Surrey to no more than 260. In the end the difference was almost exactly split, thanks to some late hitting from Jason Roy who had suffered a back spasm earlier in the day. Ben Foakes top scored for Surrey with 82. Sam Cook took 3-37 from eight overs, Dan Lawrence bowled his full allocation of 10 and took 2-52 – Surrey will be hoping for something similar from their nearest equjivalent, Will Jacks. I predict that Surrey will defend this total. Until the last over Middlesex were faring quite well in this one, buit topping 300 is big psychological boost for Hampshire, albeit that 300 is not the mountainous total it once was in this form of the game. A South African, Aidan Markram, top scored with 88 and a renegade South African, Rilee Rossouw made 64. Tom Helm, right-arm medium fast took five wickets but was made to pay for them (71 in nine overs). I expect Hampshire, with their bowling spearheaded by another renegade South African, Kyle Abbott, to defend this one. The early stages of the Kent innings saw Zak Crawley make 85 and Joe Denly 56. At the end Harare born wicketkeeper Adam Rouse hit 45 not out off 28 balls to boost the total. Benny Howell took 2-39 from his 10 overs, 28 year old right-arm fast medium bowler David Payne had 2-45 and slow left-armer Tom Smith had 2-47 from seven overs. I expect Gloucestershire to chase these down – Kent look to me like they are a trifle short of bowling options (they will almost certainly need Denly to bowl his full ten overs). A decent total for Nottinghamshire, Ben Slater making exactly 100, skipper Mullaney 40 and Luke Fletcher and James Pattinson 33 and 32 at the end. Jeetan Patel collected 5-45, George Panayi, a 21 year old right arm fast medium bowler took 2-44. Henry Brookes had an off day today, finishing with 1-78 fron nine overs. I expect Nottinghamshire to defend this total. Thus my predictions, with varying degrees of confidence, are: Surrey, Hampshire, Gloucestershire and Nottinghamshire. There is also a piece on devonlive, which I was found by way of twitter headlined “Shock and anger as entire Devon woodland is chopped down“. The piece makes clear that not only had planning permission for this atrocity not been granted, the arrogant and unscrupulous developer had not even bothered to seek it. 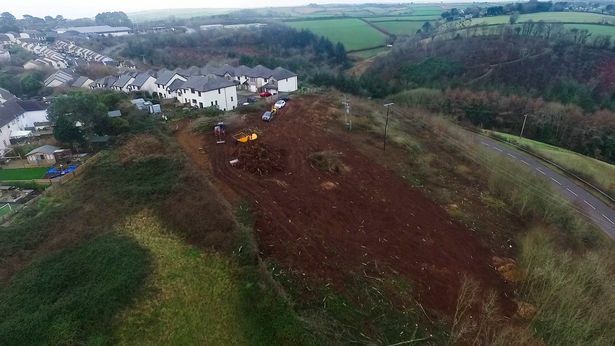 My own opinion is this developer should be punished by both a hefty fine upfront and by being made to replant the woodland at his own expense. My hope would be the combined expense of these two would put him in serious financial difficulties to teach him a lesson. I think the tiny bird featured in this picture and the next is a house sparrow – but I have not yet got a picture of it from a really good angle so I cannot be absolutely certain.